Bow River CanmoreOriginally uploaded by simmogem. This weekend Simon and I hired (or as they say here ‘rented’) a car and headed back into the mountains for a weekend of touring. 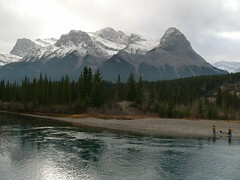 Our first stop was the hamlet of Canmore, set in the foothills of the Rocky Mountains. We had set off early and were a bit peckish so the first stop was the Coffee Pot and Curry Spot, where, as the name suggest, one can only really get coffee and curry. With a pommy cooking curry in the kitchen and singing at a volume audible out the front you can imagine I felt right at home. Refreshed we donned beanies and gloves and took a walk around the shore of the Bow River for a better look at the mountains. Simon spotted a wolf on our short walk but it darted into the bush before we had time to take a photo. Before we left Canmore, in what can only be described as good navigating, I had us off the beaten track and heading up into the mountains. Suffice to say we put the hire car through its paces on the unsealed roads and Simon was able to take a good photo of Canmore from high above.